Why Visit the Dentist in Medford Every 6 Months? Visiting the dentist twice a year takes up just about four hours out of a whopping 8,760 annually, and it can help you enjoy a healthy smile for a lifetime to come. It’s a tiny investment in time for a huge reward — so why do so many adults avoid regular dental care? Perhaps they don’t really realize why these appointments with the dentist in Medford are so important. Here, we’ve listed the top five reasons you shouldn’t ignore your regular dental care. Keep reading, then contact us to schedule an appointment today! When you come into Giamberardino Dental Care every six months, you’ll probably never be surprised by a severe toothache in the middle of the night or other emergencies requiring complex care. Early detection allows us to provide the most conservative treatment possible. Those early cavities, for instance, can sometimes be filled without the need for any anesthesia at all. And we may be able to catch weak spots in the tooth enamel before they turn into cavities — when they’re still reversible with improved dental hygiene. 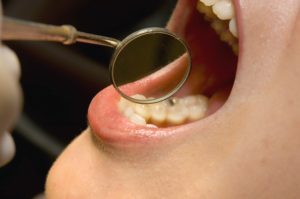 During a checkup and cleaning, your dental hygienist uses special tools to remove plaque and tartar from your teeth. Plaque is the clear, sticky substance that is constantly forming on your teeth. If it’s not removed regularly, it turns into tartar — the hard, yellow stuff you can see. Once tartar has formed, it can only be removed by a professional. The bacteria in plaque and tartar lead to cavities and gum disease, so their regular removal is important for continued oral health. As we clean your teeth, we will provide special tips and feedback to help you get a better, more thorough clean at home. It’s easy to miss a spot while you’re cleaning — and you may not realize there’s an area that’s frequently skipped over when you brush or floss. We consider patient education to be an important part of each visit to Giamberardino Dental Care. Healthy gums fit tightly around your teeth. But once infection develops, bacteria builds up between the teeth and the gum tissue, forming deep pockets that eventually lead to tooth loss. If you have pockets that indicate infection, we’ll make careful notes that we refer back to during every checkup and cleaning to monitor your gum health and prevent the negative effects of gum disease. When you visit your dentist regularly, your oral health is something you think about often. That means you’ll be more likely to brush and floss regularly and make other positive choices for your smile, further reducing the chances that you will ever need complex restorative dental care. When was your last visit to the dentist? It’s never too late to recommit to your dental health — and we can help you enjoy a long-lasting smile. Contact us to schedule an appointment today! Comments Off on Why Visit the Dentist in Medford Every 6 Months?